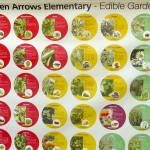 Seven Arrows School: Fully In Bloom! 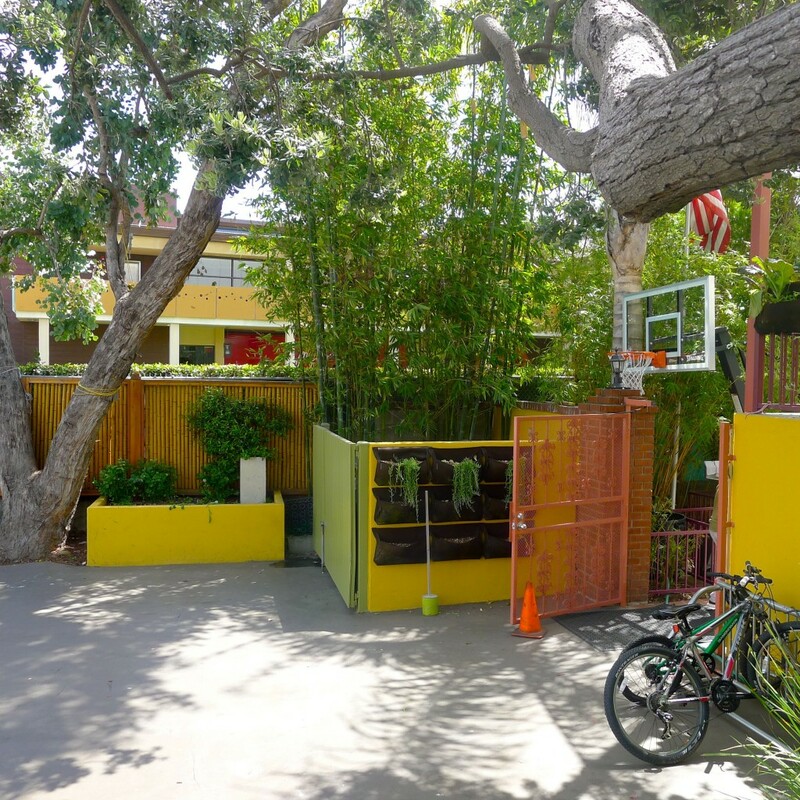 When Jamie Oliver, the British celebrity chef, cookbook author and Food Revolution guru is a former parent at the school, you can imagine what its gardens look like…they’re amazing. Jamie is a former parent at Seven Arrows School. 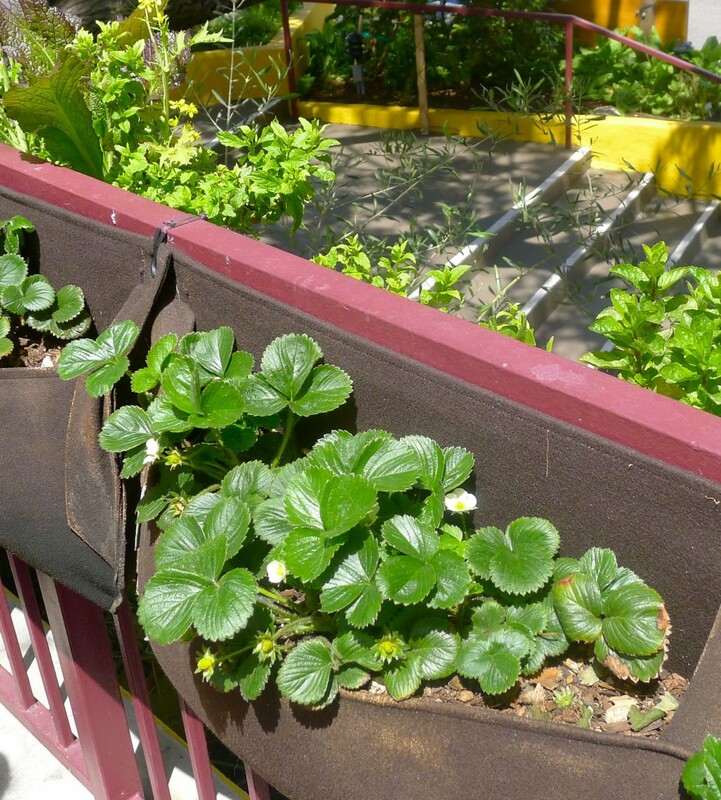 While there, he inspired a series of gorgeous edible gardens that fill every nook and cranny of the compact campus. Working his magic with kids and plants of all shapes and sizes, Jamie infused the school with edible gardens that combine healthy eating and knowledge of eco-friendly gardening as part of the curriculum. This flagship program is the first thing you notice when you enter the school! 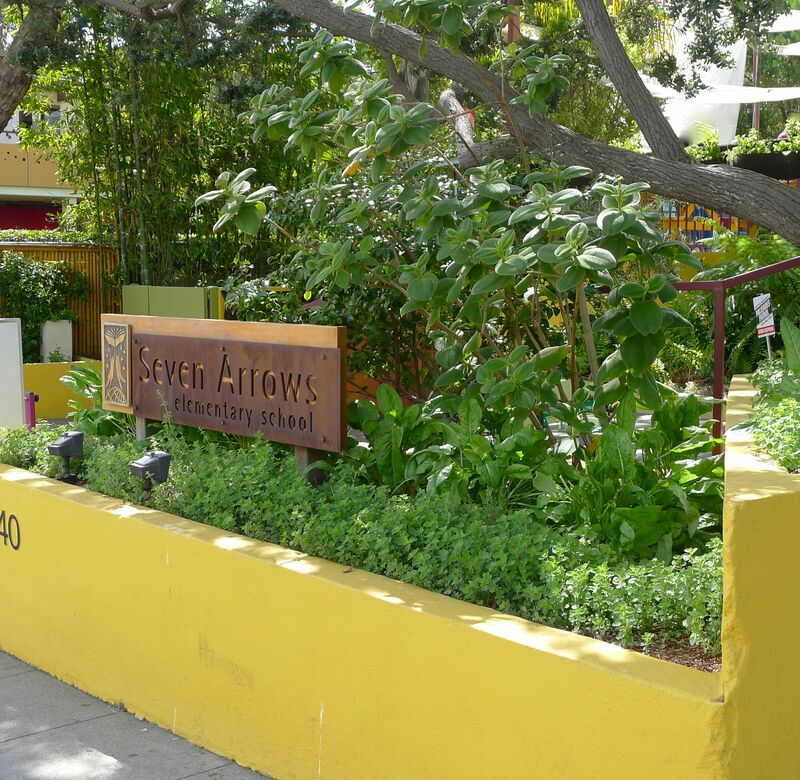 Seven Arrows is an urban school located in suburban Pacific Palisades. It is a small K-6th school, with a total of 120 students and one class per grade. Walking into Seven Arrows on a recent morning, I was immediately impressed by the schools visuals, which are a mix of subtle and dramatic. 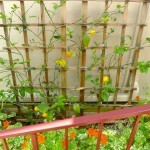 Bold colored buildings stand out against the bright green gardens, sprinkled with barely blooming flowers. Shade and sunny areas combine to create a pleasant outdoor space. 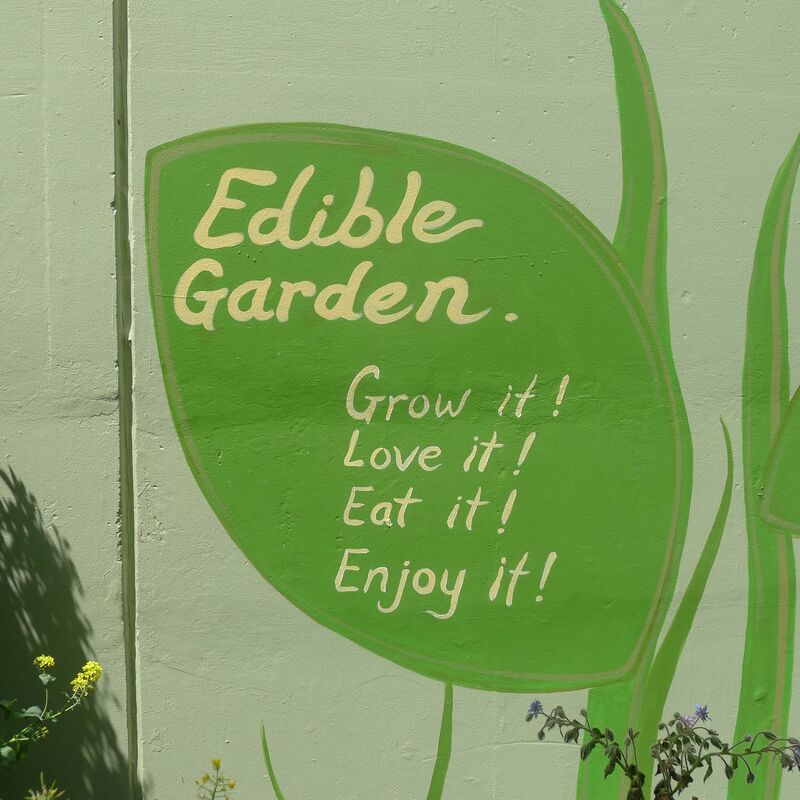 Edible plants add a sublime touch. a very dynamic educator originally from Columbia. Seven Arrows, just 15 years old, has a very vibrant, energetic feeling, much like the personality of its founder. 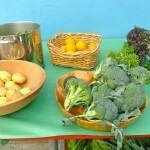 I chatted with Margarita, who is earnest and expressive, as she oversaw the Wednesday preparation and cooking of the garden harvest of fruits, vegetables and herbs in the outdoor classroom. “Gardening is a part of the school culture,” Margarita told me. “Every kid is engaged!” she said. 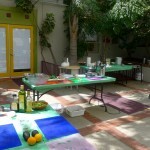 Excitement was palpable as various stations were set up and kids utilized the outdoor classroom to chop, clean, cook and eat food fresh from the edible garden. 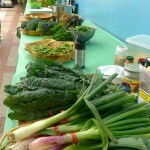 Serving as a roadmap for a lifelong approach to healthy eating, the gardening program stands out for its innovative qualities. 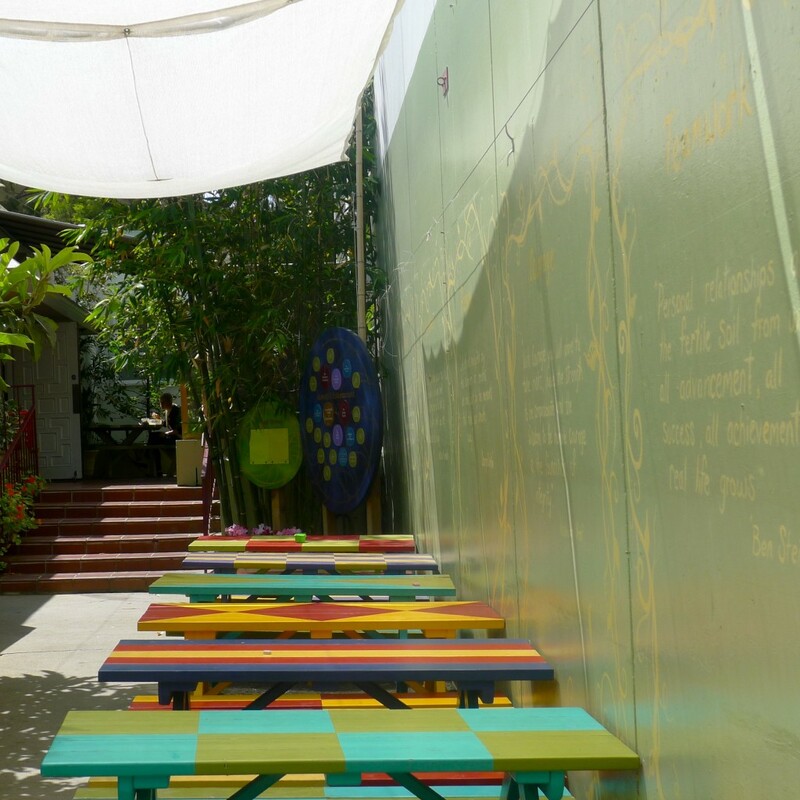 The school gardens and the outdoor classroom are a defining element of this cohesive school where healthy meets delicious! I met with Omid Kheiltash, PhD, Seven Arrows’ assistant head of school/admissions director and Lindy Berman who also works in admissions. They are both engaging, friendly and very knowledgeable, talking about the type of learning that takes place at their school and its signature programs. Omid told me that Seven Arrows is a school where academics are the result of the intersection of old and new concepts. 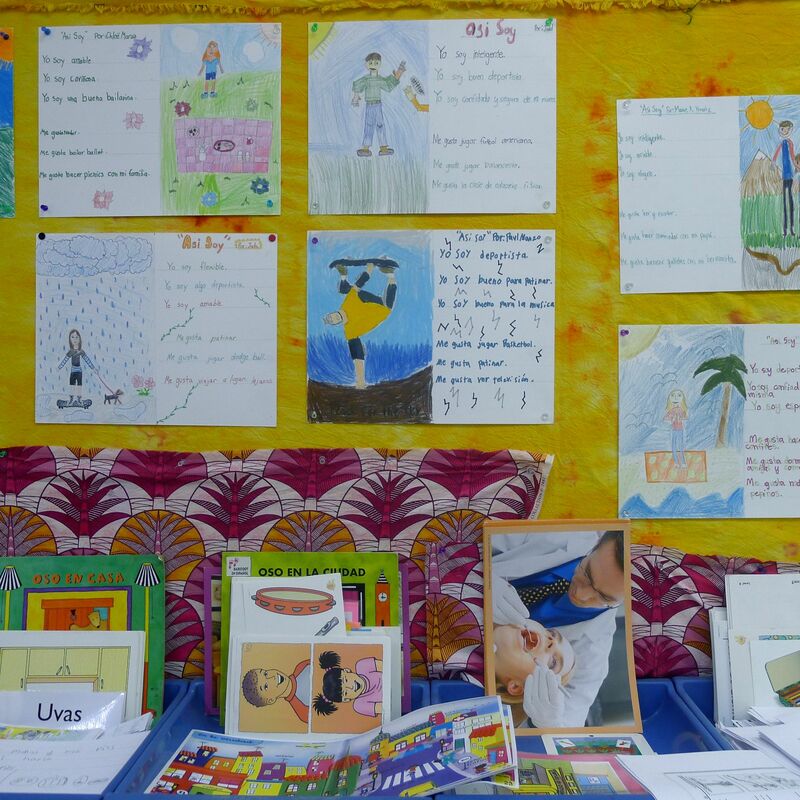 The curriculum is versatile and streamlined, with a focus on academic rigor taught within a progressive approach. Taking the best from tradition, “drill and thrill” memorization are used, but progressive elements like collaboration and choice balance the approach to learning. “Education can’t stagnate,” both administrators emphasized. 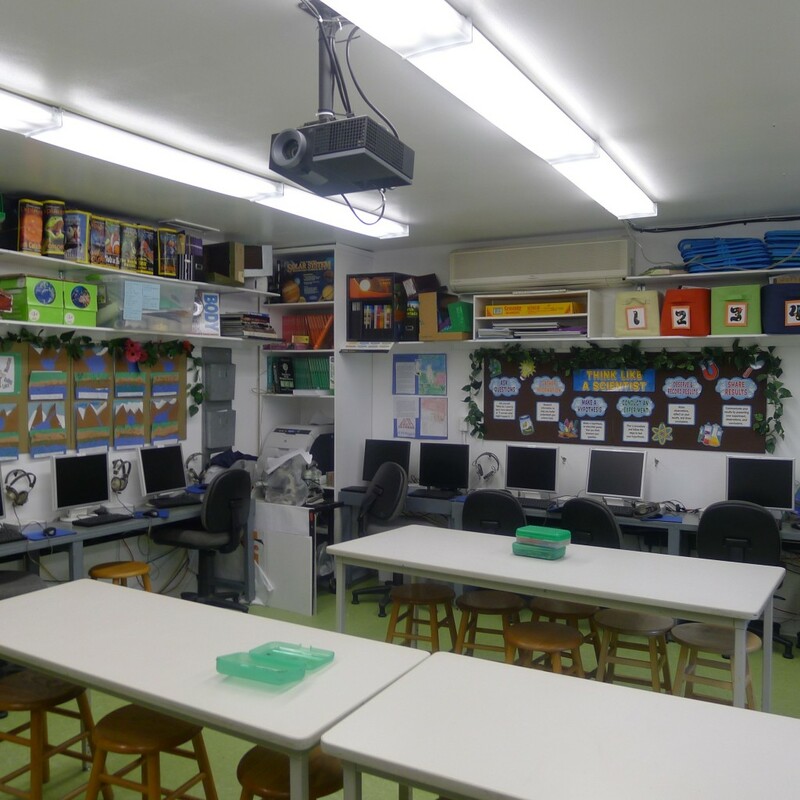 Seven Arrows makes sure the staff utilizes the latest technology and teaching tools. The school is a big proponent of technology. There is a math/technology specialist on staff. All technology is integrated into what the kids are learning in the classroom. In 5th and 6th grades, students have iPads and laptops. Bringing these resources to lower grades is the goal for next year. One of the most compelling aspects of the school is its emphasis on values and beliefs. There are seven concepts that form the centerpiece of the school’s expectations for behavior and learning, including Respect, Pursuit of Excellence, Fairness and Empathy. There aren’t just words on a page. They are ideas, which are thoroughly embedded in the school’s programs through a monthly focus on a different value each time. Counsels (school meetings) are used to discuss issues like cliques, emotions and empathy. “The messiness of life is learned in a safe place,” says Omid. 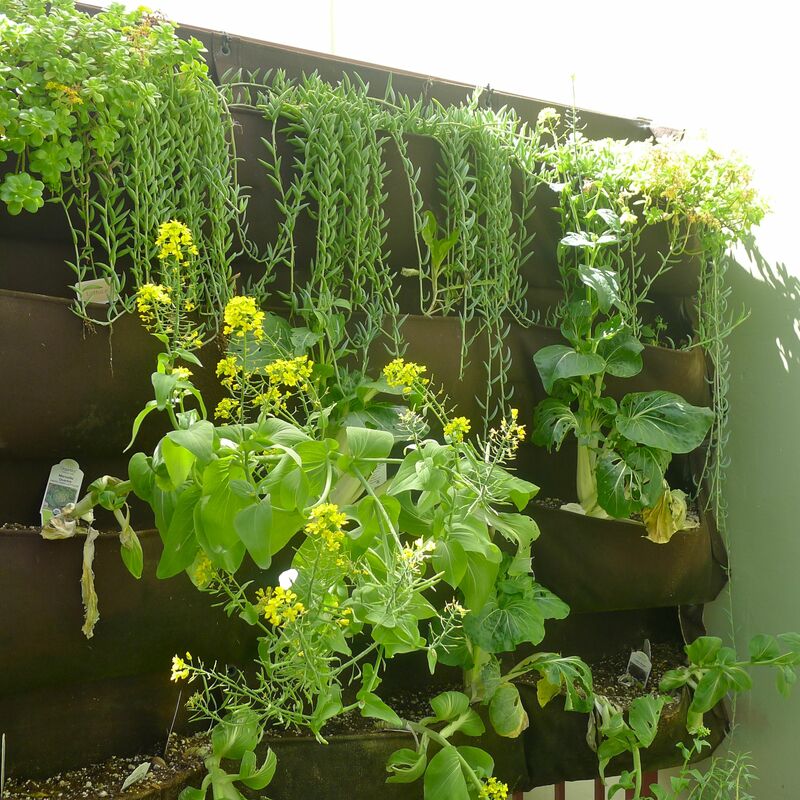 “Jamie Oliver’s legacy at Seven Arrows resulted in “Woolly Pocket” gardens are brimming with plants, herbs, and vegetables on virtually every outdoor surface. These “Woolly Pocket” planters maximize planting potential and are one of several innovative ideas we hope will be emulated by other organizations interested in edible gardens located in urban areas. A visitor to the school may also wish to test their knowledge of fruit trees as you stroll through the campus (beautiful signs will aid you if you need to take a peek! )” (Source: Seven Arrows website). 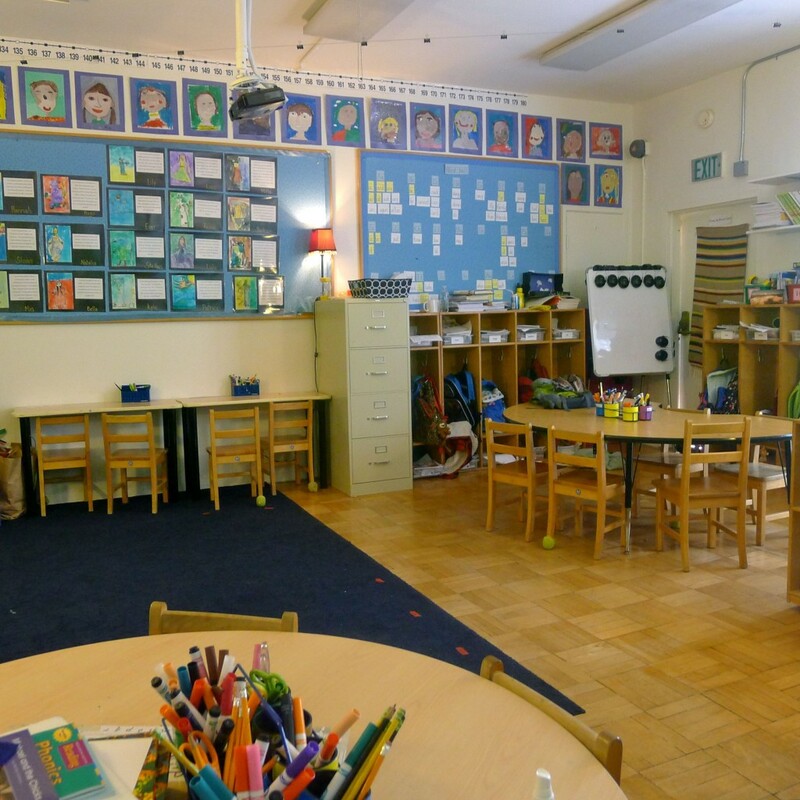 Kindergarten is a time for individualized attention in a warm, supportive environment designed to foster a life-long love of learning. By 5th grade, students are writing seven page multi-media research papers on their chosen topic. Global and world festivals throughout the year are a time for celebrating diversity of all kinds. Fridays are Kuyam or all-school assembly days where parents and the entire school comes together as a community to hear guest speakers, see kids perform, sing and celebrate the Seven Arrows community. When I asked Omid and Lindy what their admissions team is looking for, the answer was, “Parents who want what we have to offer.” Good to know! Placement at top-tier secondary schools is taken seriously by Margarita. She makes in-person presentations to the schools where her 6th graders are applying. As a result, 94 percent of students are accepted at their first or second choice school including Harvard-Westlake, Brentwood, Viewpoint, Crossroads and other highly competitive schools. Seven Arrows truly shines by drawing inspiration from its surroundings, with just the right mix of whimsy and seriousness. Unexpectedly, delightfully green, the school is complete with everything a child needs to flourish. Clearly, no dream is too big at Seven Arrows! #Wordless Weekend: L.A. and South Africa! 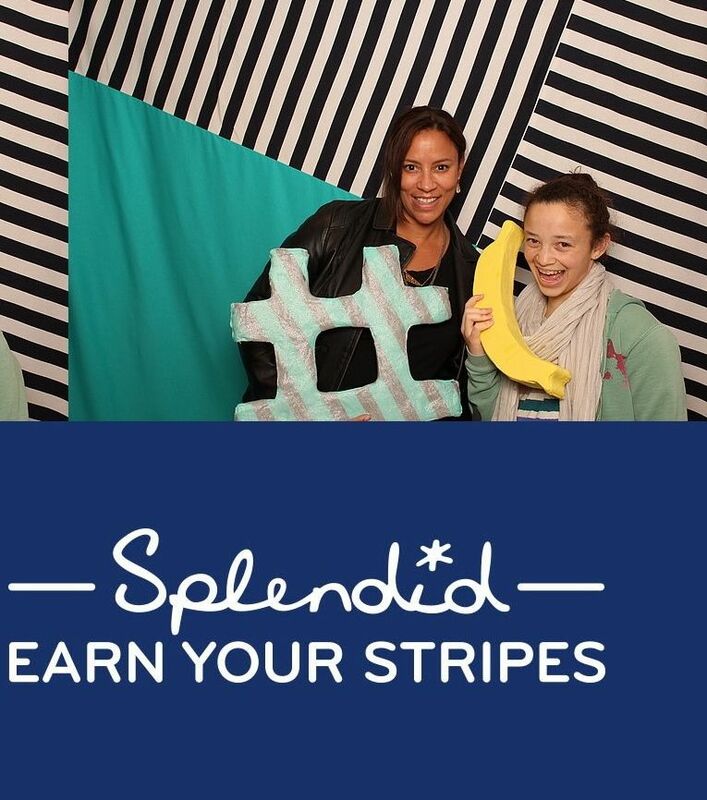 Christina and her daughter at Splendid at the Grove for Design Love Fest event. Speaking at the Mary Alice O’Connor Family Center in Burbank. 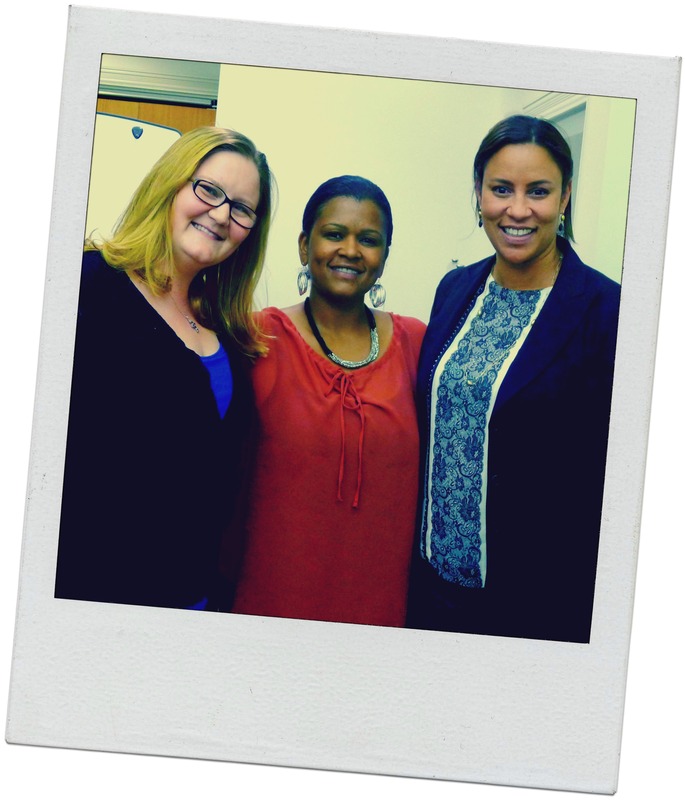 Director, Jamie Patrick and Porcha Dodson with Christina Simon. A great group of parents and an amazing preschool facility! An elegant afternoon at Oscar De La Renta. With Ashley Faucet of Move Live Style. 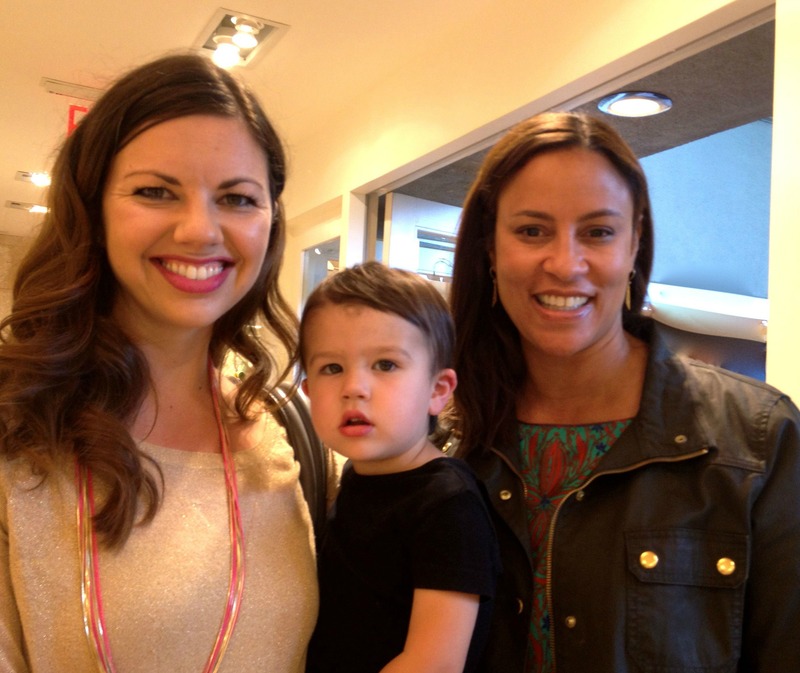 Hosted By Elizabeth Street and Baby Buggy (proceeds benefit the charity). 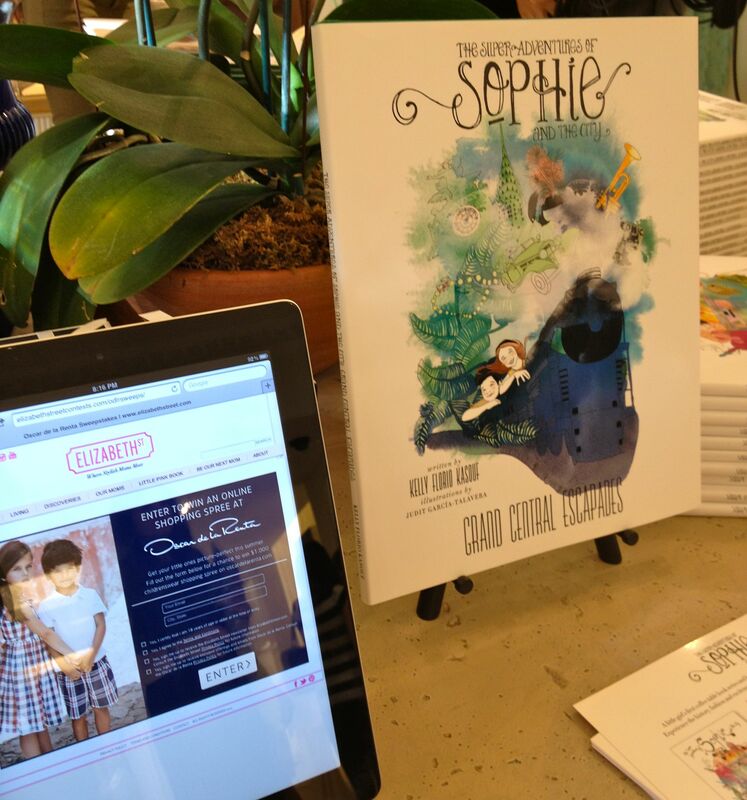 The Adventures of Sophie And The City at Oscar De La Renta! 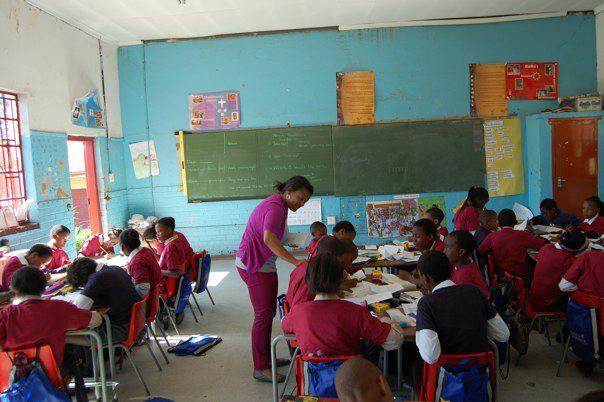 Porcha Dodson, Beyond The Brochure co-author in the classroom with school children in Soweto, S. Africa. Project Knapsack, the non-profit founded by Porcha, has delivered thousands of knapsacks filled with school supplies to African children. Christina recently joined the PK board of directors. 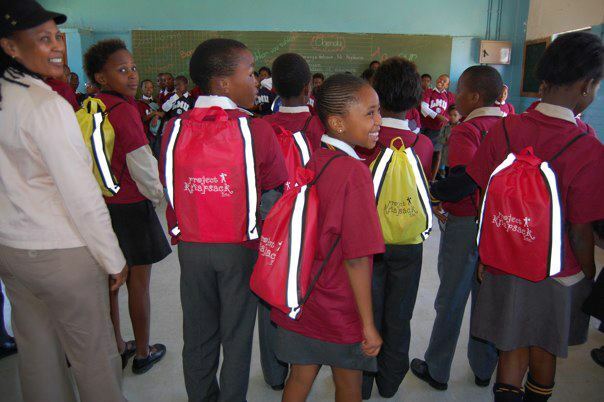 Project Knapsack backpacks worn by school kids in Soweto S. Africa. 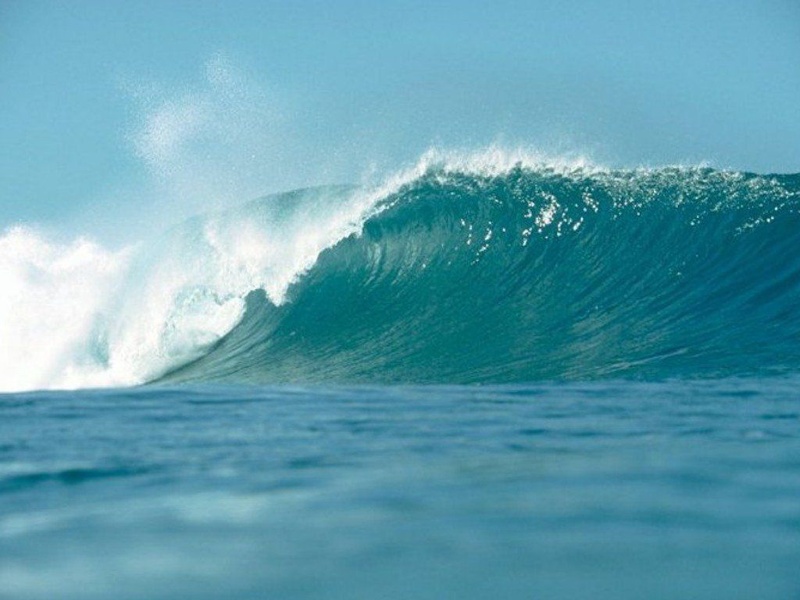 There’s an unsettled feeling on this blog. It’s a time of change for my family and many of our readers. 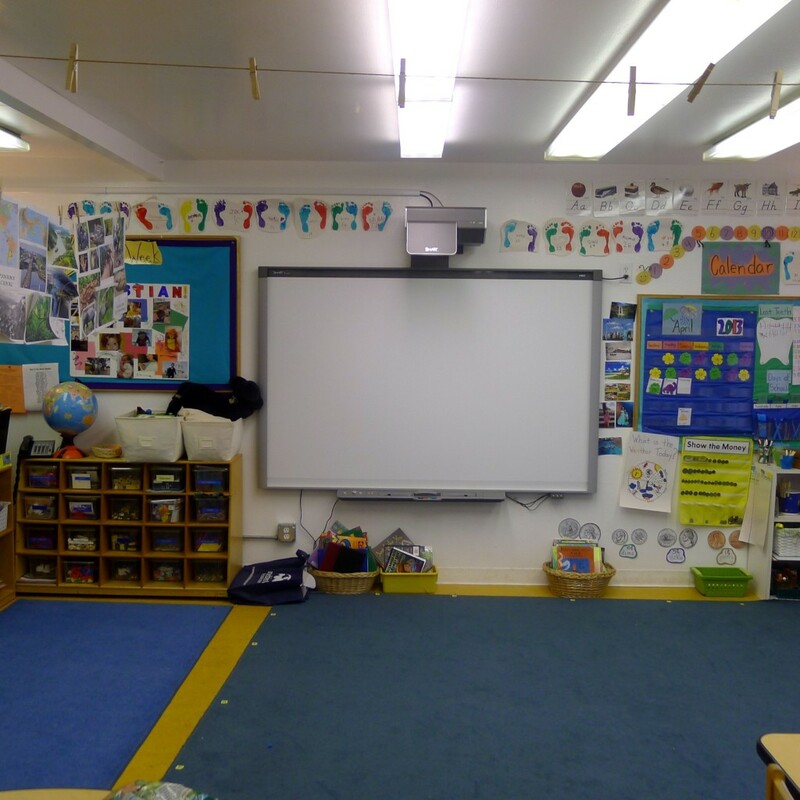 Private school admissions letters and emails have been sent, contracts signed, wait-list changes are happening and overall, this leaves one with an unsettled feeling, even when the news is the best you could have imagined. And, especially when the news isn’t what you were hoping or expecting. My kids are starting at Viewpoint School in the fall. Our entire family is thrilled and a bit unsettled. So far, the welcome has been incredibly warm. Still, we know transitions can be stressful and we’re talking a lot about what the new school will be like. My daughter has worries about making new friends (she’ll be starting 7th grade…who wouldn’t worry?). My son doesn’t really express any concerns, but can barely contain his excitement about playing sports. They are both feeling very grown up because they will be taking the bus to school. As a mom, I’m hoping to meet other moms by volunteering at school. For me, the connection with other moms at my kids’ school is important. It’s how a school becomes a community rather than a “commuter school”. I like when moms share information about summer camps or carpools or hot lunch. One of my friends has a kid starting at Viewpoint too, so I’m already feeling good about the mom friend thing. As she said in her email, “you’re going in with one friend already.” So is she! The private school admissions process can take your breath away by its sheer competitiveness. Sometimes, people you hardly know step up and help you with calls, letters of recommendation, kind words of advice and support. Unfortunately, good friends you hoped to count on offer you nothing. This leaves me feeling very unsettled. Some families are scrambling to put together a “Plan B” and that can be stressful. Your intentions were the best they could be. Your effort in applying schools was everything you could do. It didn’t happen and it’s a very shocking disappointment. Unsettled is where you might be. Angry and confused might also be good adjectives to describe the emotions. Wait-listed also describes that unsettled, up-in-the-air feeling. There’s a lot about the private school admissions process that you may never know. That inevitable leaves one feeling very unsettled. As parents we all want what’s best for our kids. Education is a huge part of that equation. That’s why this is so consuming, stressful and ultimately, hopefully, rewarding. If things didn’t work out as you planned, please, please please, don’t be too hard on yourself. This is not the kind of thing where you have enough control over the process to blame yourself for what went wrong. It just isn’t. There are options, always. You just have to be open to them. Just like tomorrow is a new day, next year is a new year. Like Beyond The Brochure on Facebook for all the news that’s fit to print, but won’t fit on the blog! My kids go to Temple Israel of Hollywood (TIOH), which we initially chose because it is all of 11 minutes from our house and because I liked the idea of a progressive Jewish education as a hedge against our kids becoming vapid, entitled jerks in a city that – and I can say this because I love this town – is full of them. TIOH, I am thrilled to say, is not. 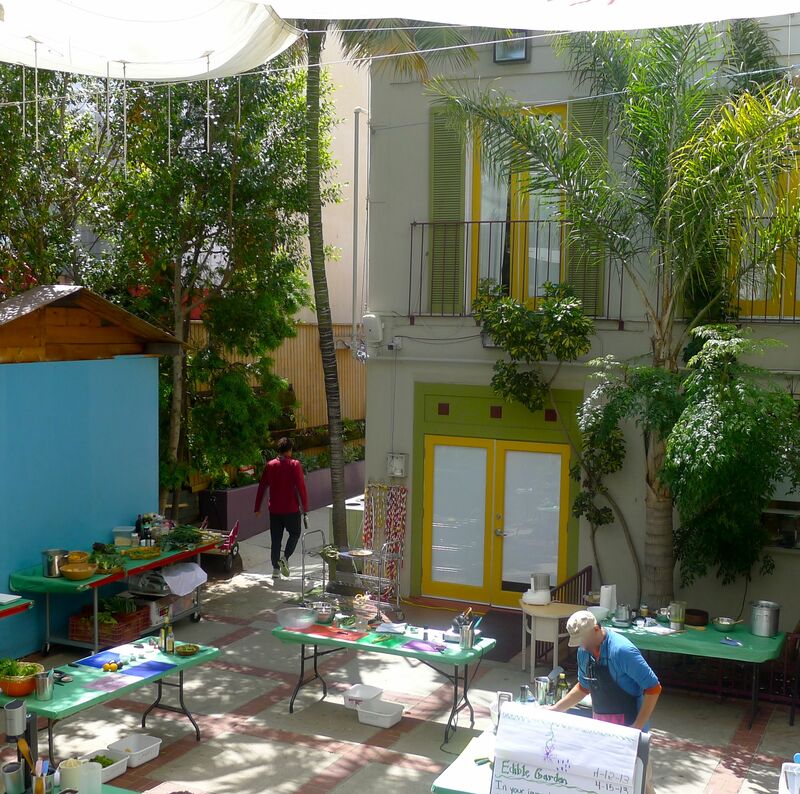 The community is warm and creative and incredibly down-to-earth, and the Mom-style there reflects that. It’s a pretty basic East Side vibe. I have moved through the whole gamut over the last four years, and no one has batted an eye. No one ever comments when some Mom shows up with an overcoat over her nightgown, because most of us have been there. But everyone goes nutso crazy when one of us shows up in a clean drape-y blouse over clean jeans, or throws some lipstick on. I know this because when I bother to make an effort, which I’m doing more lately because I’m working more, I get so much love at drop-off I feel like the hottest Mom on earth. 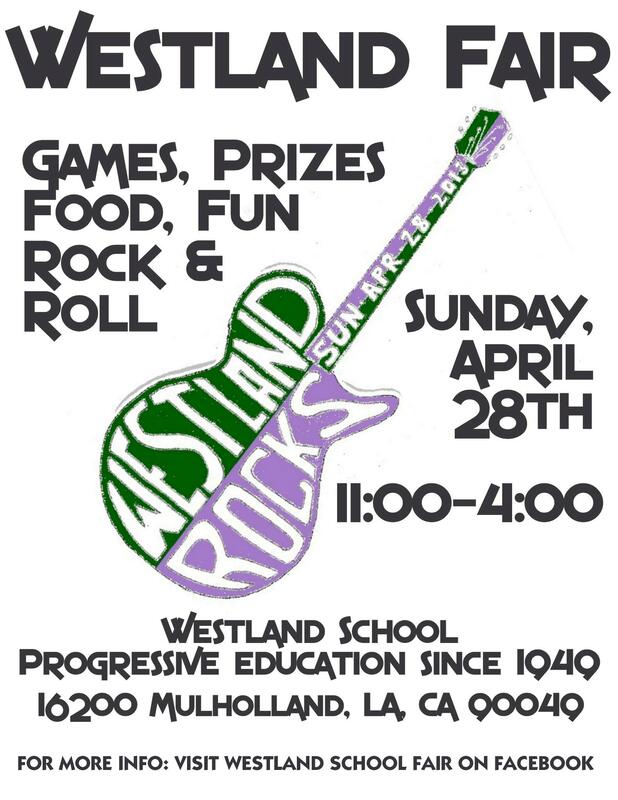 Westland School Fair, Sunday, April 28th! Westland School Fair is open to the community and its a lot of fun!